While the costs of 3D printers were astronomical a few years ago, the technology is increasingly becoming common in public libraries—often thanks to generous grants and donations. The Sunnyvale Public Library near the San Francisco Bay received a $13,500 Library Services and Technology grant through the California State Library in 2014 to purchase a high-tech printer, and the Mountain View Public Library received a similar award a year earlier. The Young Adult Library Services Association announced in February that it would be helping outfit 100 facilities across the United States with printers, including the Santa Cruz Public Libraries system, and equipment is available to the public for free in San Diego, Sacramento and other Golden State libraries up and down the west coast. Although the bill was originally drafted in January, it managed to mostly avoid making its way to the ears of the media until Tuesday this week when Parker Higgins, an activist with the Electronic Frontier Foundation and self-described “copyright hipster,” drew attention on the matter on Twitter. “People love those mandatory DVD piracy warnings. Let's make more of those that make even less sense!” Higgins joked. Because 3D printer technology allows users to emulate physical products by reproducing them using space age polymers and computer engineering, copyright concerns have indeed been raises in recent years as fears mount with regards to the possible intellectual property repercussions. 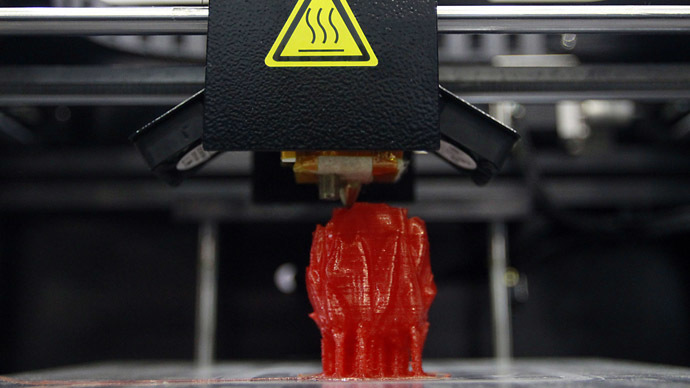 Earlier this week, reports commissioned by the UK Intellectual Property Office were released, in turn providing an expert assessment for the British government on how 3D printers will specifically impact IP law. “Although it is too early to tell when this will happen, our research concluded that there would really need to be evidence that 3D printing is an everyday reality before legislation is needed. Otherwise there is the danger that over-hasty legislation could stifle creativity and innovation,” Dinusha Mendis, a co-director at the Centre for Intellectual Property Policy and Management at Bournemouth University, said of the findings, according to Phys.org.